If you frequently suffer from back pain or simply want to come home and relax in a comfortable chair, this rocker recliner from Flash Furniture might be exactly what you are looking for. Since it is manufactured by Flash Furniture you know that it is durable, and it also comes at a budget friendly price that most consumers can afford. This oversized chair measures 40 inches wide and 42 inches high. The seat depth is 39.66 inches making this a great chair to curl up in or for larger adults to sit comfortably. Its extra wide design and sturdy construction also ensures that it can support most adult weights, typically up to 400 pounds. You will love how soft and comfortable the leather upholstery feels. It is also easy to maintain. Simply wipe the rocker recliner down with a damp cloth and it will continue to look like new for years to come. The overstuffed back, seat and arm rests ensures plenty of comfort. 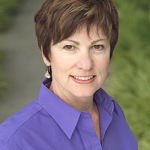 The thick foam padding won’t easily break down or disintegrate over time. It is capable of comfortably supporting your back while you are seated, and since the head rest is also padded you can easily recline for a nap. When the chair is in the upright position it can function as a glider, and since it is designed to be nearly silent it is perfect for rocking fussy babies to sleep. When you are ready to recline simply pull and the lever and the attached footrest while extend as the chairs lies back. To ensure plenty of support and comfort the footrest is also padded. 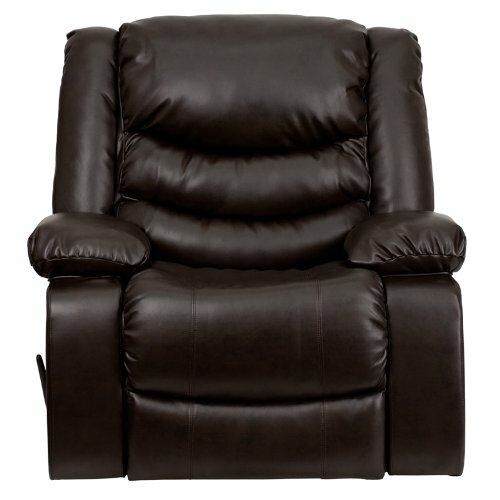 The dark brown leather upholstery and oversize design make this rocker recliner a great fit for your family room or in a den. 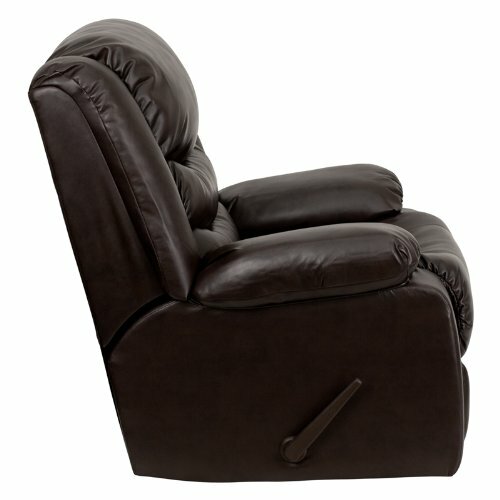 It should be noted that due to its larger size this rocker recliner will probably not be a good choice for small spaces. 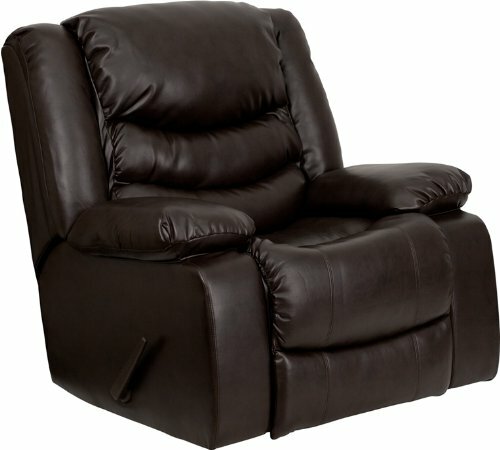 Its oversized design and extra foam padding ensure that this rocker recliner is comfortable for larger adults. 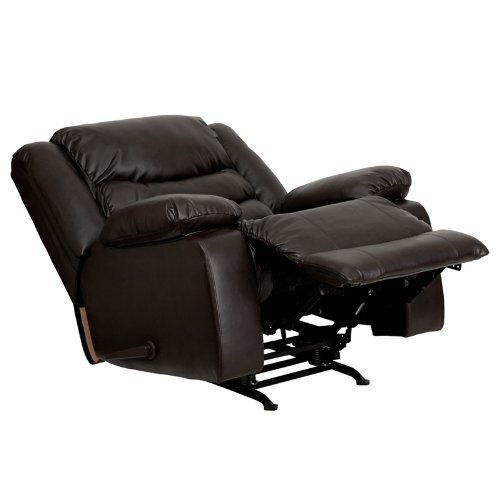 The padded footrest ensures plenty of lower back and leg support when it is in the reclining position. The side lever is easy to pull so you can recline and sit back up without straining or having to get up. 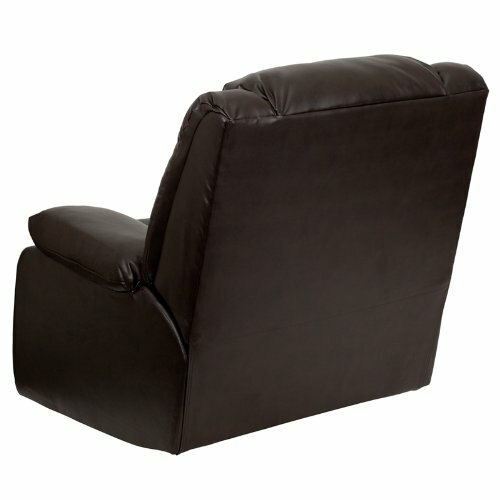 While most reviews are positive regarding this rocker recliner, some consumers have noted that the lever can be a little difficult to reach. This generally only occurs with children and smaller adults and does not affect the chair’s overall comfort or performance.